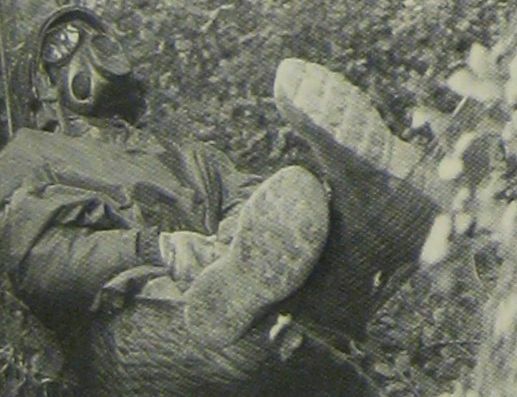 A soldier takes a rest break during Autumn Forge 83 (which included Able Archer 83) — in a gas mask. From Air Man. 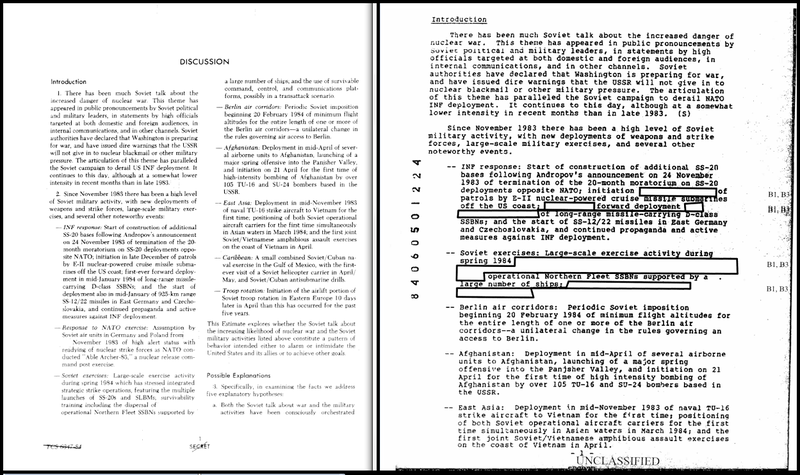 The memo also revealed that the United States provided the original, top secret version of the SNIE to its British allies, but created a “sanitized” version –which removed all mentions of “Able Archer 83,” the very reason it was created– to provide to other NATO allies that participated in the NATO war game. As I write in “Countdown to Declassification,” the US classification system was used to restrict information about the increased risk or nuclear war from our NATO allies for two reasons. The first was to protect the UK’s double agent with the KGB, Oleg Gordievsky. The second, and more nefarious, was to ensure that NATO (specifically West Germany) would not waver in its decision to host the newly deployed US Pershing II nuclear missiles, which could reach Russia in 10 minutes –upsetting the previous nuclear strategic balance in Europe, and leading directly to hair trigger alerts, Operation RYaN, and the danger of Able Archer 83. “Sanitizing” the danger of nuclear war from our NATO allies. This JIC report has similarities to a still-classified comprehensive 100-page US President’s Foreign Intelligence Advisory Board report on Able Archer which the National Security Archive is still fighting to get released. The reports of possible Soviet miscalculation of Western nuclear intentions convinced Thatcher to attempt to compel the United States to “consider what could be done to remove the danger that, by mis-calculating Western intentions, the Soviet Union would over-react [to Western war games],” and ordered British officials to “urgently consider how to approach the Americans on the question of possible Soviet misapprehensions about a surprise NATO attack”. “Whatever the reliability of the specific JIC assessment,” one official concluded, “its paper has served as a catalyst for consideration of the inherent advantages of agreeing some confidence building measures relating to nuclear command post exercises.” These concerns were likely discussed during Reagan’s June 5, 1984, meeting with Prime Minister Margaret Thatcher and other officials at 10 Downing Street. No analogous brief has been found for Able Archer 83. 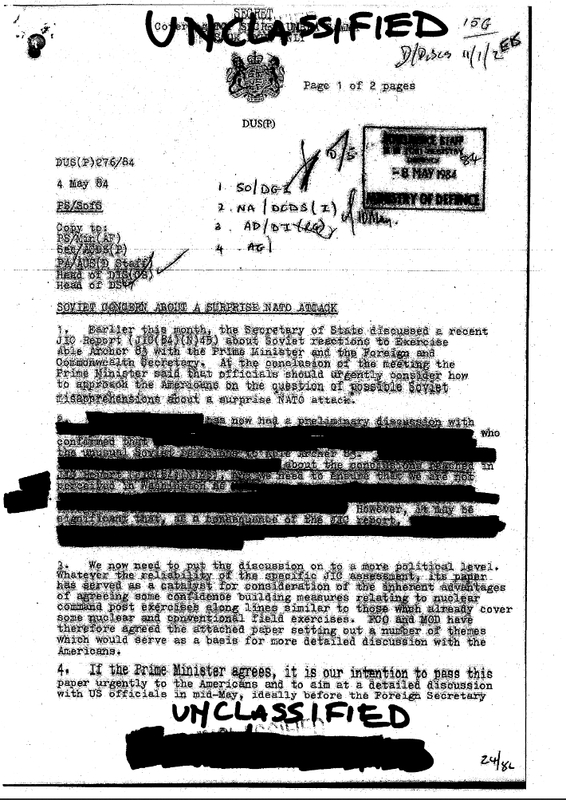 Below are the documents originally posted by Peter Burt of the Nuclear Information Service.